10 tips to keep your home happy during the winter months! It’s nearly October, which means great things like apple orchards, sweaters, Halloween and the leaves changing colors! It also means turning on the heat, preparing for snow and dealing with leaves. Here are 10 quick tips to help you prepare for fall! 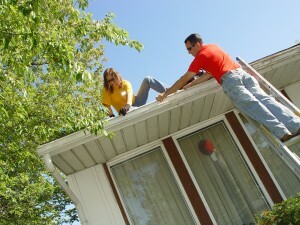 • Gutters– Inspect and clean out any debris from gutters and downspouts. Your roofs’ drainage system diverts thousands of gallons of water away from your home’s exterior and foundation. Keep these cleared to prevent damaged exterior surfaces or flooding on your lower level. • Winterize– Seal gaps and cracks around your windows and doors with weather stripping and caulk. Weather stripping is easily the most cost effective way to benefit in heating and cooling savings. 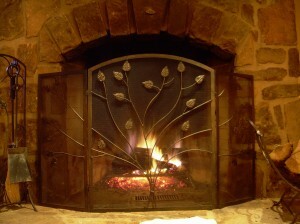 It helps reduce the drafts and keeps your home more comfortable year round. • Inspect– Grab your binoculars and inspect your roof. It is best to manually get up and look at the surface up close and check out all your shingles, check for curling, missing or loose shingles. 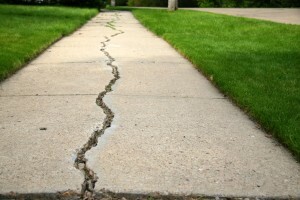 • Tripping Hazards– Look at your driveway and sidewalk to inspect for cracks. It is best to seal them before winter hits and makes a small problem into a big one. Look for cracks that are more than 1/8 inch wide, un-even sections and loose railings on steps. • Refresh– Change out your furnace filter to keep clean air circulating through your home during the closed in season. • Get a Check-up– Have a certified professional come in and inspect your furnace to ensure you are ready to start heating your home again. They will check belts and make sure the system is running at optimal levels. • Sweep It– If you have fireplaces hire a chimney sweep to get rid of soot and creosote build-up before your first burn. Be sure to have the flue inspected as well for blockage like birds’ nests which could cause an unsafe/internal fire. • Keep the Moisture– Check and replace any pads for the home humidifier for those cold, dry months. • Safety– Test all smoke detectors, CO monitors, and Fire Extinguishers. Briefly talk to your family about a fire escape plan. • Heat– Your water heater needs love too. Start by draining the water heater and clearing out any debris that has settled in the tank. While the changing seasons can be a fun and beautiful time of year. Make sure you are ready for what the change brings with these helpful tips.